Let users know why they should opt-in to receive push notifications from your app. Rue La La is a members-only site that provides big discounts on the most-wanted brands in fashion. Their mobile app is the quickest and easiest way to shop their site from anywhere at any time. 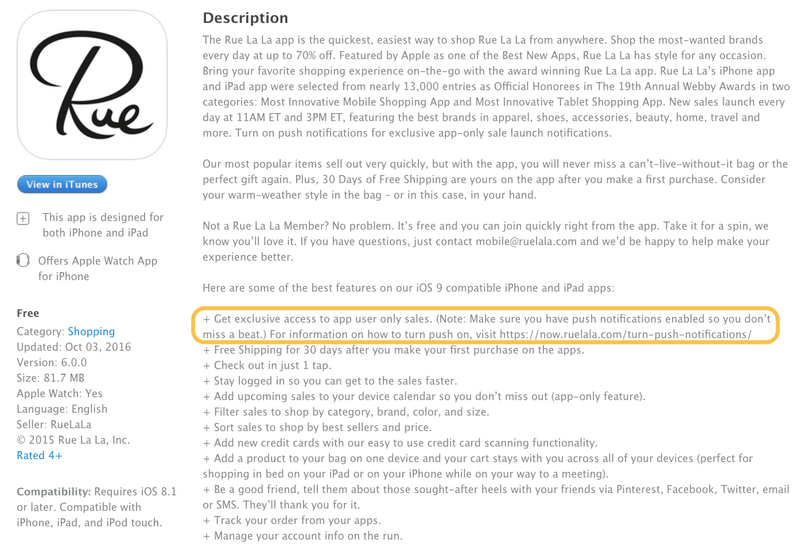 They value the push notification opt-in so much that the first feature they call out in their app store description is the ability to “Get exclusive access to app user only sales” by opting in to push notifications. Calling this out lets the potential user know up front that in order to get the most out of the app, they’ll need to opt in to these types of messages and notifications. They also include a URL in their description that has an animated gif with step by step instructions on exactly how to turn on push notifications. 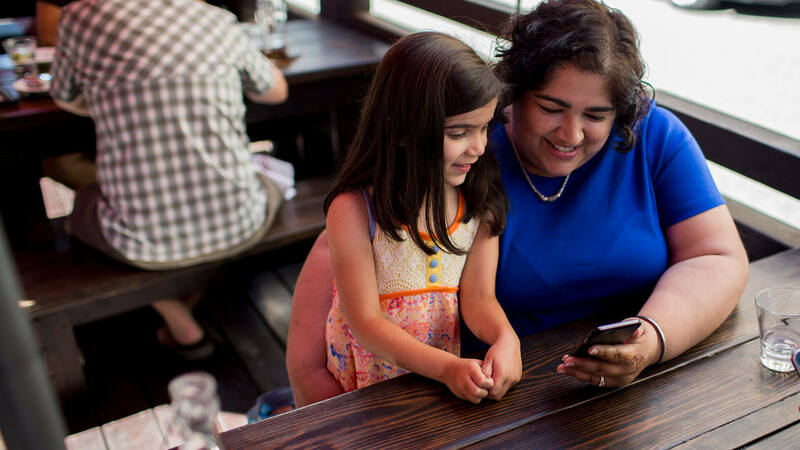 Once your app has been installed, follow up again with another reminder of these benefits. Consider guiding your user through the key functionality of your app and explain the benefits of the push notifications before asking the user to enable them. The NHL added a customized screen explaining why a user should enable push notifications before the system dialogue box that asks to turn them on and saw a 10 percent increase in their opt-in rate. If a user says “Don’t allow” to the standard iOS opt-in screen, there’s still a chance to get them back. 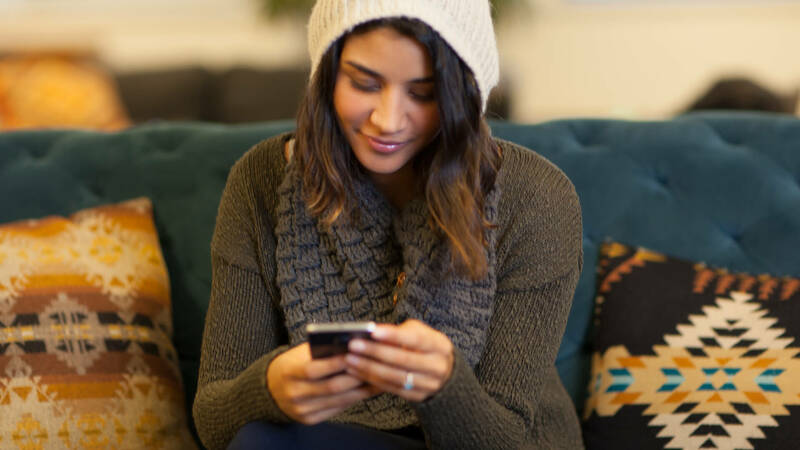 One way is to send an in-app message that illustrates the benefits of opting in to push notifications, then links them back to device settings to enable notifications. Users can also turn on push notifications at any point in a preference center within your app. The majority of apps rely on the System Preferences settings of their host platform to manage the permissions for receiving push notifications. As a mobile app product owner, this is not the ideal location because (a) your app’s preferences are mixed in with all of the other apps, and (b) they aren’t customized for granular permissions specific to your app. You can’t count on users accessing your app’s settings in the System Preferences area of their phone – and you want to avoid a likely on/off scenario if they get there. 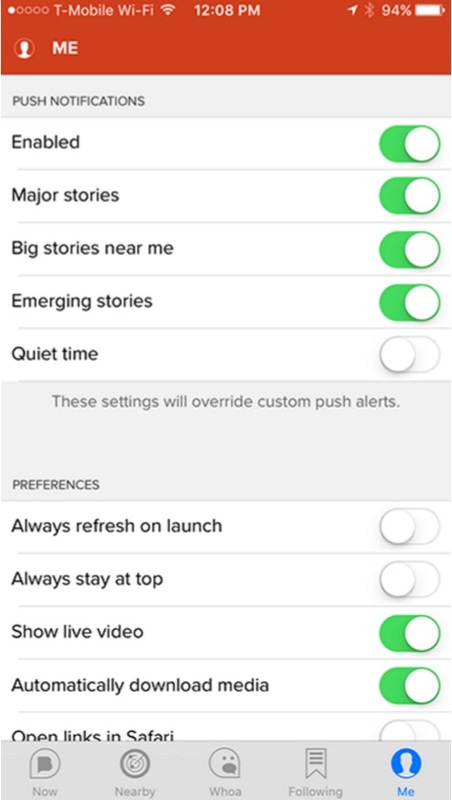 To get around this “bridge too far” problem between your app and System Preferences seetings, consider doing what the Breaking News app did, which is to add a push notification preference control within your app. Breaking News uses this as a convenient way to let their users control the type of push notifications they want. 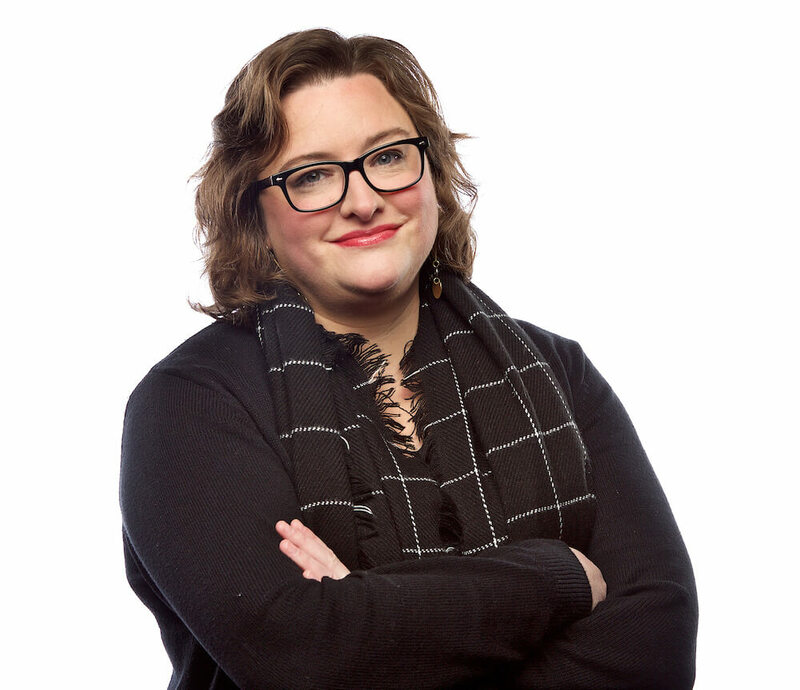 While you may initially be hesitant to give users micro-controls to what they opt in to, it is a great way to establish trust with your audience and ensure your app delivers them the value they want. • How send frequency impacts notification engagement rates, and more. 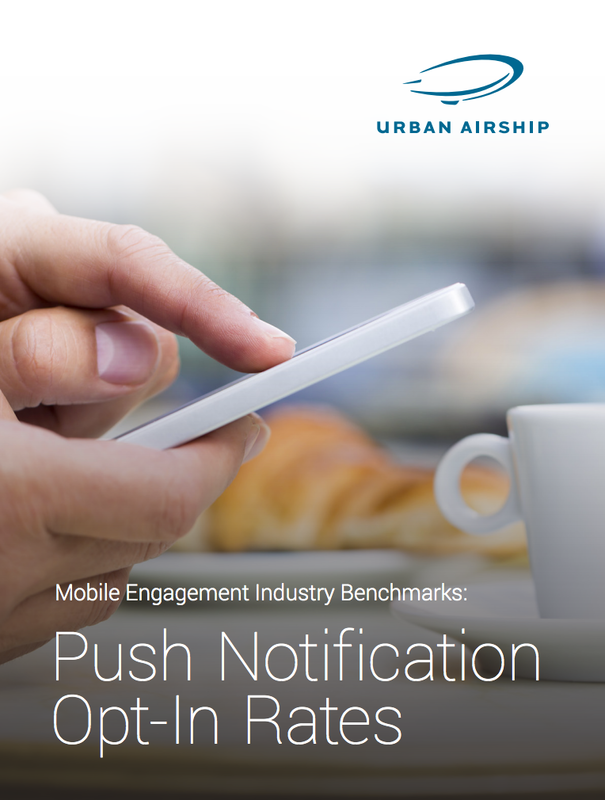 Download our Push Notification Opt-In Rates Benchmark Report today!